The Common Brushtail Possum is the best known of all our possums because it has adapted to living in our cities and suburbs. As the suburbs overtake natural areas, animals are forced to live in close quarters with people. While we are privileged to be able to observe our fascinating native animals at such close quarters, living with wildlife, however, has its own special problems. Each year, the Wildlife Management Branch of the Department of Primary Industries and Water (DPIW) receives many calls for advice to solve possum problems. The following notes provide practical information to assist the house and landowner without harming the animal. Remember that Brushtail possums are protected by law and cannot be taken, trapped or killed except by a permit (please phone the Wildlife Management Branch on (03) 6233 6556). The Brushtail possum is nocturnal, spending the daytime asleep in its nest (which can be anything from a tree hollow, a rock crevice or a lovely warm roof!) and coming out at dusk to feed. As an adult it is typically cat-sized with a pointed face, long oval ears, pink nose and bushy black tail.Studies of the a behaviour of brushtail possums showed that about 16% of their time is spent feeding, 30% travelling, 44% immobile and 10% grooming. In Tasmania, the Brushtail possum has 4 main colour variations: silver grey, brown, black and gold. The very dark possums inhabit denser, wetter areas than the lighter colour variations. Brushtail possums lead a largely solitary life. However in areas where numbers are high and shelter is in short supply, several may share sleeping places. Home ranges vary from 1 to 15 hectares. Brushtail possums rub secretions (from glands under their chin; on the chest and at the base of the tail) to mark home ranges and define occupancy of a home site. If a home range is vacant or undefended because the occupant has died, been removed or has become too old and sick to put up a defence then another possum will claim it. Both sexes may breed at one year of age but they have a higher success rate in breeding during the second breeding season after birth. 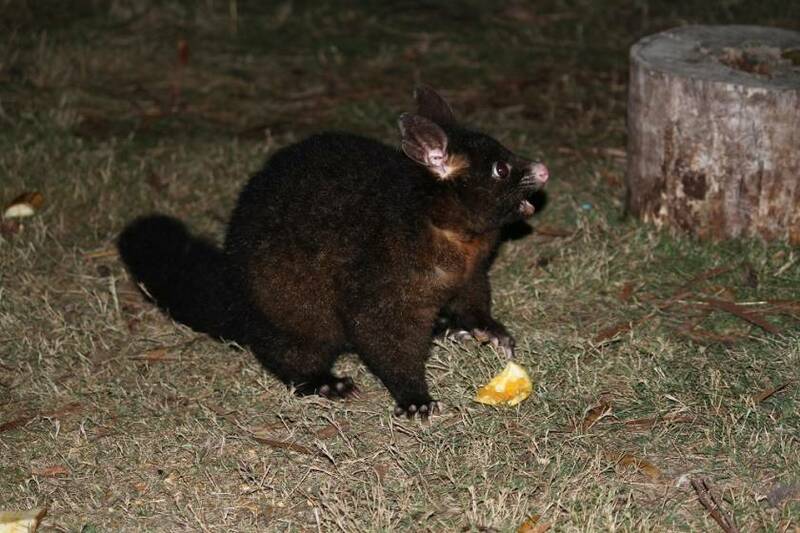 Although Brushtail possums generally have only a single joey, the forward opening pouch contains two teats. The young are born after a pregnancy of 17 to 18 days. Brushtail possums have been known to live for 10 to 12 years in the wild.